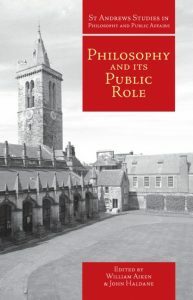 Philosophy and its Public Role (2004) Co-edted with William Aiken, this volume presents new essays on topics ranging from the public responsibility of intellectuals to the justice of military tribunals, and from posthumous reproduction to the death penalty. Contributors: J. Haldane, R. Brecher, J. Arthur, D. Carr, T. McLaughlin, W. Donnor, A. Moore, G. Cupit, B. Gruzalski, J. Child and R. Brook. Read Philosophy and its Public Role. “This book should attract two kinds of readers, people interested in seeing philosophy find and deal with real issues in society and public policy, and people who have an interest in the role philosophy plays in the criminal justice system” Journal of Value Inquiry.